New Year’s Eve is one of the biggest part of Lunar New Year. Despite all the old traditions that are lost, most of the traditions of New Year’s Eve are still around. This is the THE designated day to clean out the house. Every table top, shelf top, and every nook and cranny must be cleaned. Having a lot to clean, this is usually a family effort – bringing the family closer to prepare for a fresh start of the year. This is also very important because once the new year starts, it is taboo to pour out water or any sort of throwing motion in fear of throwing out good luck. The story of how these came about revolves around a monster. It was said that many years ago, there lived a monster called the Nian Shou (年獸), which translated means “year monster”. Every year, the monster comes to the village to attack the villagers. Usually, the villagers all leave town, but one year, an old grandma and grandpa decided to stay and fend off the beast. Fear of red and loud noises being the monster’s weakness, the couple placed red cloth on the doors and clapped sticks in order to create loud noises to fend off the beast. This evolved to the spring couplets and fire crackers we know today! Similar to that of Thanksgiving dinner and Christmas dinner, this is the meal to bring all family members together. Some family dinners are just one table of a more nuclear family, but some parents and grandparents have so many brothers and sisters that there needs be a small size banquet hall to fit the family! During dinner, no bad news or any inauspicious words are to be spoken. Only happiness and laughter are allowed at the table along with the many foods of the new year – fish, chicken, white radish cake, dumplings and much more. This is the iconic moment of the celebration. 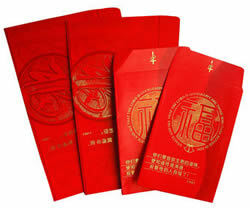 After dinner, the family would gather together to hand out red envelopes,”hong bao” (紅包), filled with money. Red envelopes are usually given from elders to the youngsters, each one followed with new years greetings and wishes for a better year. 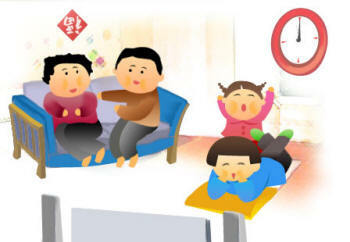 After the exchange of good luck and red envelopes, the family sits together and enjoys each other’s company. Children are encouraged to stay up as late as possible. This is called “shou shui” (守歲), literally translated to “guarding the age”. It is said that the later the kids stay up, the longer the parents will live and the more luck there is in the new year. This entire night is called “wei lu” (圍爐), literally translated to “surround the stove”, because in the olden days, families would be around the stove for warmth as they spend the night together. At midnight, every household strings in a line of firecrackers to mark the start of the new year. After the firecrackers have sounded through the streets, it is tradition to use your hands to push the shreds into the house. This is symbolizing using your hands to bring in wealth.